Contemporary Meets Traditional In Chelmsford. 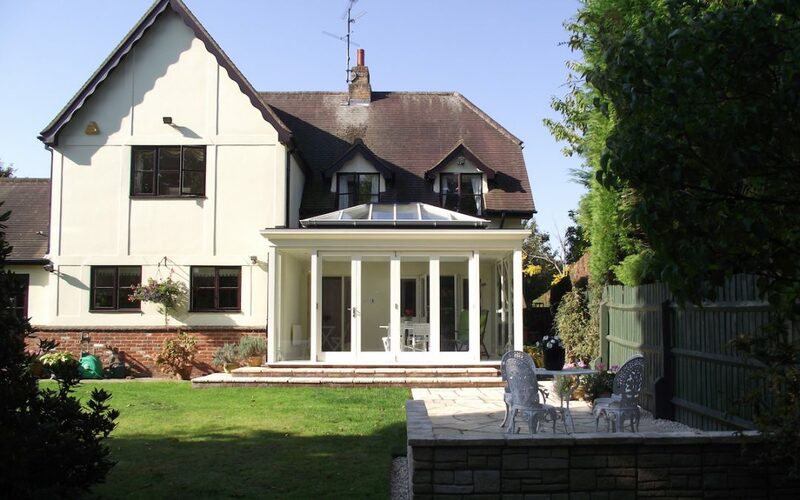 Just because your home is a traditional style doesn’t mean that you must build an extension that’s also traditional. Of course if your property is listed, you will need to work with your local planners to find an appropriate style that’s acceptable, but the family who lives in this traditional Chelmsford home were not subject by such restraints. 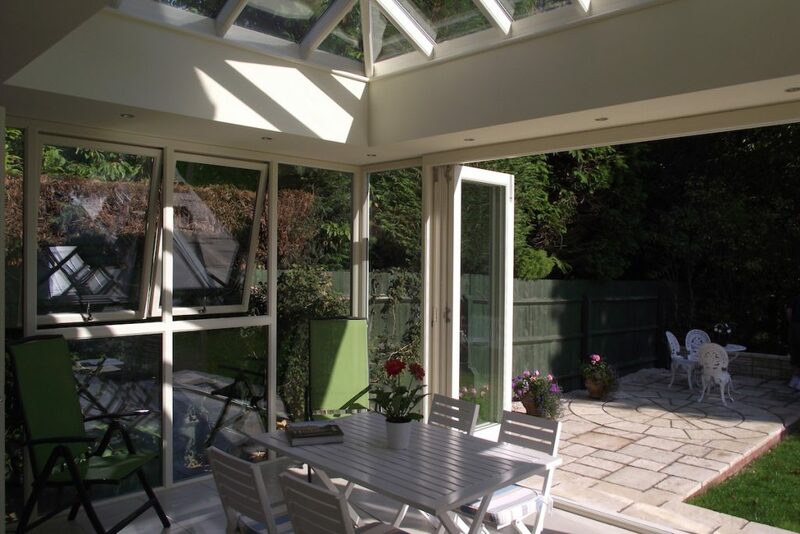 So when they decided to add a light filled space that would connect them to the garden, they approached the Cambridge Conservatory Centre to design them a contemporary orangery that would sit comfortably alongside their traditional home. This stunning home has an old slate roof and wonderfully quirky gables over multi-paned windows so it was vital to choose a roof line that would sit harmoniously without taking attention away from the beauty of the traditional features of the home. We also needed to take into account the height restriction created by the second story windows. The answer was to design a contemporary orangery that would sit perfectly in a corner next to the central double story gable fronted section. 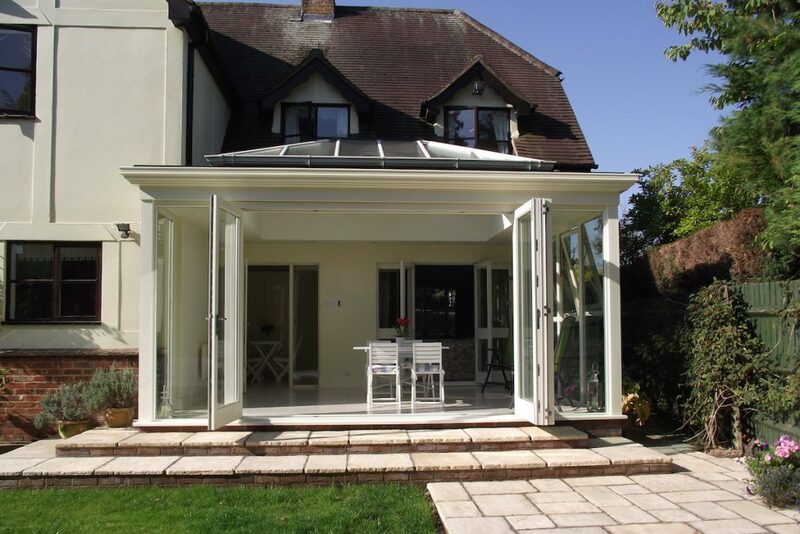 Using slim profiles and keeping the design simple was the key to giving the orangery the contemporary look the owners were after while ensuring it took nothing away from the beauty of the traditional architecture. From the inside looking out the connection to the garden is obvious. 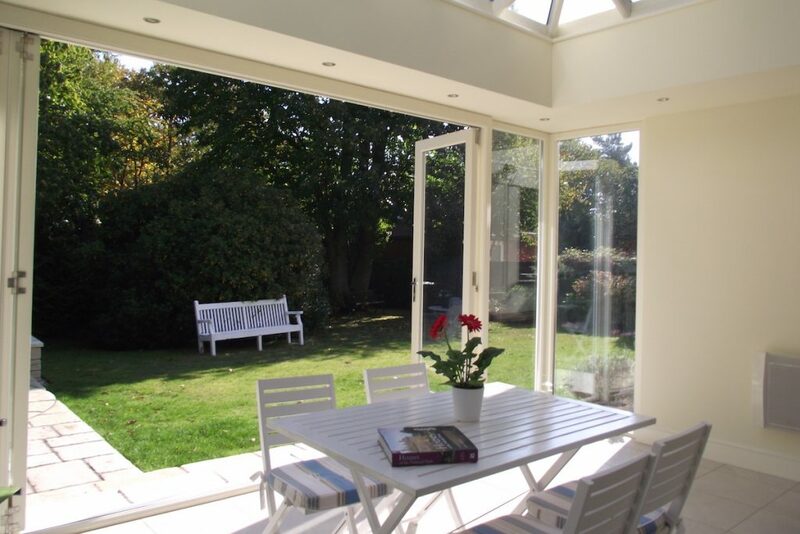 The corners of the contemporary orangery are completely glazed giving a wider view of the garden and a set of four panel doors fold open to blur the lines between the inside and outside. By tiling the floor in a neutral tone and selecting a similarly coloured paver for the steps outside, the two areas flow seamlessly together. A casual seating area inside the orangery is mirrored by one on the patio outside; the green of the fence is accented by a high backed chair to either side of casement opening windows. And the owners are delighted by the success of the marriage of traditional and contemporary spaces. It’s everything they were hoping for.